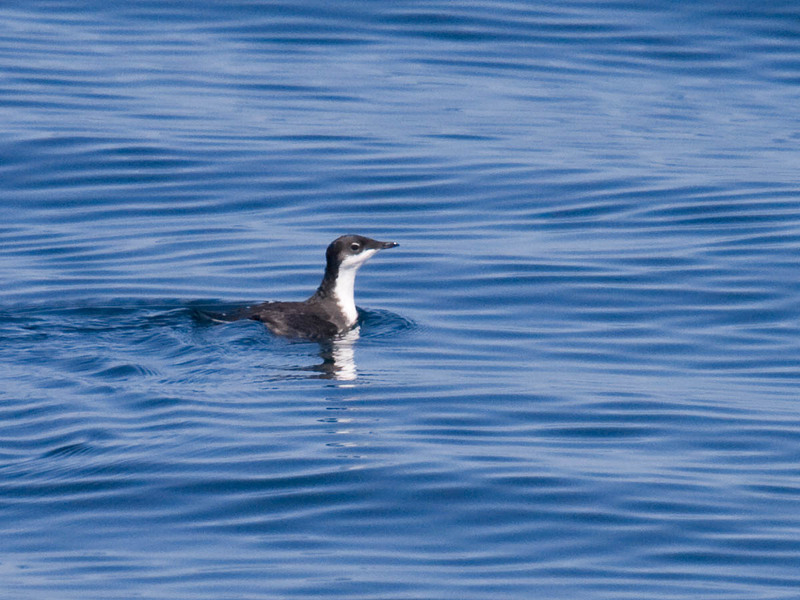 Scripps's Murrelet. 20 miles off Newport, Oregon, September 15, 2012. This past weekend our pelagic trip enjoyed calm seas. The trip generally had low numbers of birds and was mostly unremarkable until... we were able to circle the boat around a pair of these rare birds. This bird is no longer on the Review list of Oregon rare birds. It was removed in 2010. Nevertheless, it is hard to find since it usually stays far offshore. We've seen this species on about 15% of trips, July-October. We would see it far more often if the seas were as smooth as last weekend, but that is usually not the case. From a show of hands at the time, this was a life bird for nearly all on board except the guides! You may be interested in our trip report from last weekend. 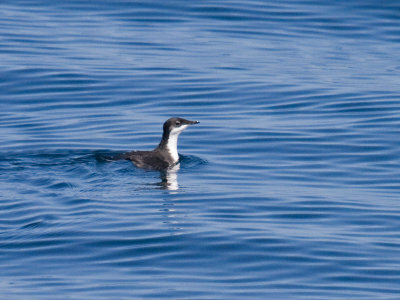 On June 9, 2012 The Bird Guide, Inc. hosted a home school group on a 5-hour pelagic adventure. The goal was to see Black-footed Albatrosses at a most affordable price in the shortest time possible--5 hours. This is harder than it sounds. Albatrosses feed on the shelf break. Off Newport, Oregon this is offshore at least 20 miles. Our usual boat--which is the largest (55 feet) in Oregon licensed to go far offshore, cruises at about 11 knots (12.1 mph). With at least a half hour in the bay, and perhaps 45 minutes stopped to chum the albatrosses up to the boat, our usual boat didn't allow us enough time to accomplish our goals in 5 hours--in fact, our usual trip took 8 hours and required about 20 minimum passengers. We had only a dozen participants, which would have made our usual boat prohibitively expensive. No, we needed a smaller, faster boat. We found such a boat with one of our old deck hands who had recently earned his captain's license. This 43 foot boat cruised in excess of 15 knots (16.5 mph). This would get us out over 20 miles and back, plus allow harbor transit time, some near shore time, and chum stop time in a 5 hour trip. As far as seabird diversity goes, June is probably one of the lowest of the year. Many of our regular fall and spring seabirds are in the Arctic in June where they breed. However, several Oregon seabirds are actually southern hemisphere breeders during December, thus are feeding off Oregon's shore in our summer, but their winter! Our target albatross is one of these birds--they nest in the outer Hawaiian Islands, which are in the northern hemisphere, but keep a breeding schedule identical to all other albatrosses that nest in the southern hemisphere. Despite this not being a time of spectacular pelagic bird abundance, there were still lots of birds. We saw all expected species except Fork-tailed Storm-Petrel. Fun birds in the bay included Osprey and Caspian Terns. Three species of cormorants nest around the bridge we traveled under. Western Gulls are the nesting gulls here, though we also saw one Glaucous-winged Gull, too. Along shore were Pigeon Guillemots, a few Marbled Murrelets, and thousands of Common Murres, which nest nearby on Yaquina Head. There were a few late Common, Pacific, and Red-throated Loons still migrating north. Harbor porpoises put in a brief showing. Offshore there were scattered Sooty and Pink-footed Shearwaters. A few Dall's porpoises and Pacific white-sided dolphins came alongside the boat. But all-in-all there were few birds. 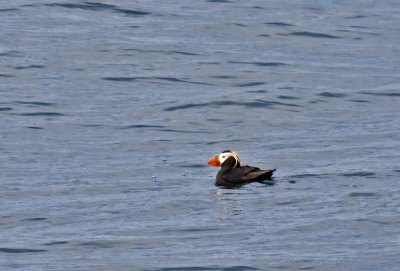 We did manage to see a few Cassin's and Rhinoceros Auklets and circled the boat around an obliging Tufted Puffin. 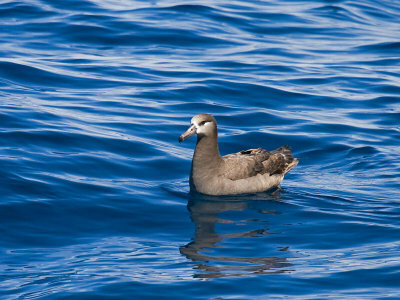 Our chum stop was 25 miles offshore, where we enticed 6 Black-footed Albatrosses up to the boat to the delight of all. Success!